SubstanceSportsAuctions.com is a portal to over hundreds of collectibles through our New auction house. You will find everything from Sports Memorabilia to Art. Whether you just like to window shop or are a serious collector looking for that one specific piece that has eluded you for years, SubstanceSportsAuctions.com will provide the tools necessary to make your collecting experience more enjoyable. Bid on whatever you might be interested in comes up for auction or bid on all your desired lots in our auction from one central location so that you never miss an item. Our aim is to provide you an easy to use Auction house interface that gives you the ability to find those hard to find items. This is why I’m hot hot..this is why I’m hot hot..have you listened to the Mim’s song..its a wow. You know there are songs which can instantaneously make you feel upbeat, this is one of them. When I think of upbeat, to motivation to aggression, the name that comes to my mind is an epitome of aggression, Cassius clay AKA Muhammad Ali. Muhammad Ali, the king of trash talks, he used it as a bait to make his opponent loose the temperament before the match. Once he shouted to his opponent sonny Liston, ‘you are smelling like a bear’ and vowed to donate him to the zoo after he beats him. He he…just imagine the level of burn in Liston. The above image is not of good quality but it’s self-explanatory, we can see that the signature has changed over the years, and its fascinating how the rules of graphology can be tallied with real life events. His career started in 1960 and by the end of 1963, clay has record of 19-0 with 15 knock outs, and in 1964 he was a contender for heavy weight championship title. You can see the roaring confidence in the signature, the open-top ‘a’ tells us about the trash talks, the above and forward ‘i’ dot signifies the super-confidence. In 1965 he was already a heavyweight champion, and along with the bulging confidence (as ‘i’ dot goes more forward) we can find the hint of spirituality in his signature. There are significant upper loops in ‘a’, ‘d’, & ‘h’ with his surname uplifting from the baseline. The raging bull was finally slowing down as his bouts were going till the 15th round and he knew subconsciously his era was ending and that reflected in the signature (78′ sample),the overall upward movement is gone, spiritual confidence is no where as no upper loops are there. Afterwards he tried to recover his image as a boxer but all is gone by then. His 1981 writing shows although he tried to keep superstar image by the large ‘m’ as earlier but no significant loops, overly stressed middle zone tells us that he has got much involved in his day to day family life. The signature comparison provides so much information, that a 1000 words essay can be written out of it, but lets keep it crisp, so that the crunch doesn’t go from the time I write it, to till the time you read it. 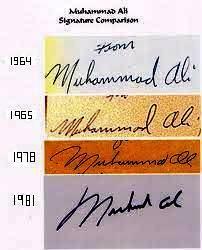 If you are aware of meaning of slants in Handwriting, you can understand that this type of slant is not normal for a person like Muhammad Ali, They are almost like a Type-I hand writing. We have already received the hint of his higher involvement in day to day activities from his last signature, along with that when we see the writing style of ‘I’, which is looking like it got slipped and fell into the floor with top round squeezed to nothing, we can understand that at this stage of life he lacked both spiritual and sporting interest, and was emotionally dependent, involved with the woman in his life. Ken Norton Sr., an International Boxing Hall of Famer who is recognized by pundits as one of the greatest heavyweights in the sport’s history, died Wednesday after a long battle with congestive heart failure. He was 70 years old. Norton, whose professional boxing career spanned three decades, died at an Arizona hospital where he had been undergoing rehabilitation due to complications stemming from a stroke, according to the Los Angeles Times’ Claire Noland. Norton had previously overcome two strokes, a heart attack, quadruple bypass surgery and prostate cancer. The former heavyweight champ is perhaps best known by boxing fans for his trilogy of fights against Muhammad Ali in 1973 and 1976. 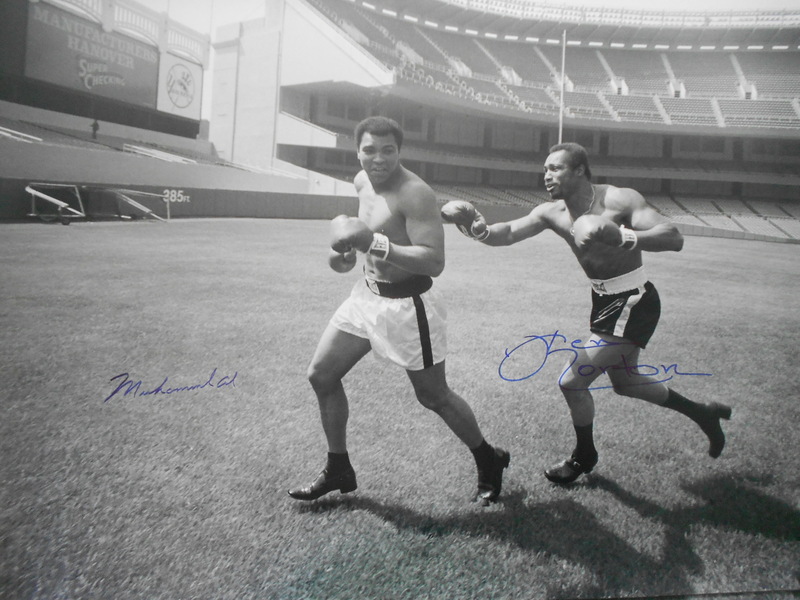 In the first bout between the two men, held at the San Diego Sports Arena, Norton shocked the world by defeating Ali in a split-decision and breaking his jaw in the process. Ali would get revenge with controversial victories in their next two fights—one later in 1973 and the other in 1976—but Norton’s victory over Ali in their first fight made him a star. He parlayed that notoriety into a fight against George Foreman in 1974, and a title win over Jerry Quarry in 1975 when Ali had vacated the strap. Though Norton would lose the belt back to Ali in 1976, he would be awarded the WBC championship a year later. Larry Holmes defeated a declining Norton in 1978, ending a championship run that had lasted parts of five years. Inside the sport of boxing, Norton is well-known for popularizing the cross-armed defense. Rarely seen before Norton employed the tactic to success early in his career—most notably against Ali—multiple other heavyweights began adopting it. Norton, though, had perfected the craft. Where other fighters who used cross-armed protection often struggled with counterpunching, Norton’s hands were quick enough that he rarely had that problem. He finished with a career record of 42-7-1 with 33 knockout victories. His last fight came in 1981, when he was knocked out by Gerry Cooney at Madison Square Garden. After Norton’s boxing career, he worked in the entertainment industry as an actor and commentator. He appeared in television shows like The A-Team and Knight Rider during the 1980s. Norton is survived by his two sons, one of which is former NFL linebacker Ken Norton Jr., who won three Super Bowls over his 13-year career with the Dallas Cowboys and San Francisco 49ers. Norton Jr. is currently the linebackers coach for the Seattle Seahawks. For all your Ken Norton Memorabilia needs please go to my website: www.substancecollectables.com 30×40 size dual signed photo only $899.99 ON SALE! Using layers of hand-cut paper, spray paint and stencils, both artists worked round-the-clock over one weekend to create an energized series of mixed-medium murals that echo the raw dynamism of the Iron Mike gym and capture the hope, struggle and desire that are at the heart of every fighter here. The artists deliberately incorporated elements of urban street art to make the murals both visceral and refined to directly reflect the raw, gritty talent each of the fighters started with as they work to refine their skills and transform themselves into champions.Lurato’s work has also been featured on ESPN as part of the “Art of Basketball” project, created by Billi Kid and Public Works Department, an organization that promotes street and graffiti artists and their work. Licensed by the NBA, the organization features a growing collection of NBA-themed original street artwork that tours the country. Lurato’s contribution focused on the 2012 championship-winning Miami Heat. To learn more about Joe Lurato and Logan Hicks, check out their work at joeiurato.com and loganhicks.com. Iron Mike Productions, previously Acquinity Sports, is a boxing promotion company co-founded and led by CEO Garry Jonas. It is a partnership with Hall of Famer Mike Tyson committed to changing traditional boxing promotion by advocating for its fighters’ successes inside the ring and out, throughout their professional careers and into retirement. Iron Mike Productions, previously Acquinity Sports, is a boxing promotion company co-founded and led by Acquinity Interactive CEO Garry Jonas. It is a partnership with Hall of Famer Mike Tyson committed to changing traditional boxing promotion by advocating for its fighters’ successes inside the ring and out, throughout their professional careers and into retirement. Injured elbow slows down boxing king Floyd Mayweather Jr.
Pound-for-pound king Floyd Mayweather said he dislocated his left elbow in the middle of his majority decision over previously unbeaten Saul Alvarez. The 36-year-old Mayweather earned a record $41 million purse Saturday for a dominating 12-round victory in which he claimed Alvarez’s World Boxing Council and World Boxing Association super welterweight belts. “I could have used more combinations down the stretch. 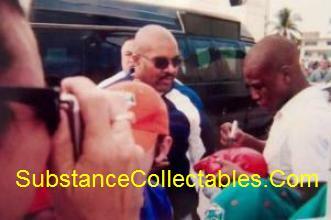 I think I dislocated my elbow,” said Mayweather during the post-fight news conference. Mayweather said that for rounds six and seven he couldn’t use his jab because of the suspected dislocated elbow, although round seven still turned out to be one of his strongest of the fight. 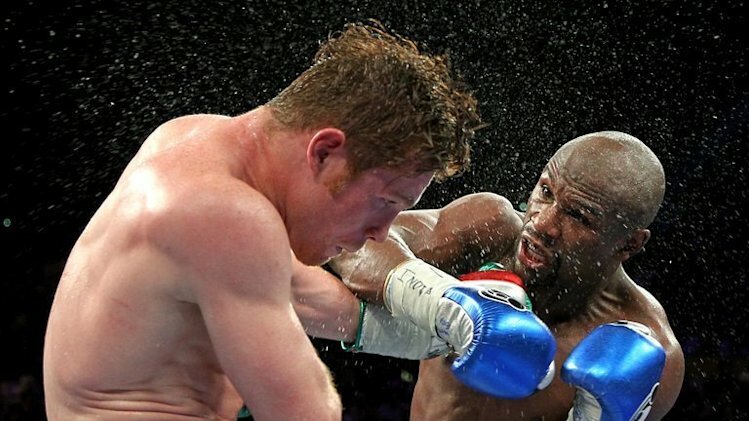 “My arm was hurting, and I wanted to stop using my jab and just paw with it,” Mayweather said. Doctors were expected to examine the elbow this week. 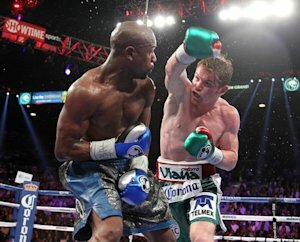 He used his superior hand speed to keep Alvarez at bay, but Mayweather still only managed to win the fight on two of the three judge’s scorecards. Judge CJ Ross surprisingly scored it a draw, 114-114. The other two judges, Craig Metcalfe (117-111) and Dave Moretti (116-112) had Mayweather winning in a breeze. Ross surprised many by giving six rounds to Alvarez. She is also one of two judges who scored a win for Timothy Bradley over Manny Pacquiao last year. Mayweather criticized Ross after the fight. “I think it is a woman, and she could be older,” said Mayweather. Mayweather was fighting for just the second time since being released from prison after serving a sentence for assaulting the mother of his children. Mayweather gave away 13 years in age and 15 pounds to the younger and stronger Alvarez. The Mexican fighter tipped the scales at Friday’s weigh in right on the 152-pound catch weight. But by the time he entered the ring, Alvarez had ballooned to 165, 13 pounds heavier than he was at the weigh in. It was also 10 pounds heavier than the weight he had been sparring at in the week leading up to the fight. The added weight made him look slow and awkward in the ring as he suffered the first loss of his career. This was the second fight in Mayweather’s six-bout, 30-month contract with Showtime that could pay him more than $200 million. Saturday’s fight marked the first time since 2007 that he has fought twice in a calendar year, and Mayweather said he plans to repeat that schedule in 2014 and 2015 by fighting in May and September. 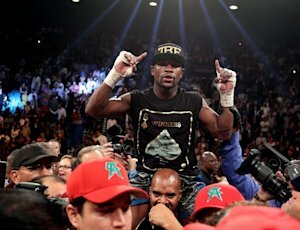 Mayweather repeated several times after the fight that he is counting down the months until retirement, and he believes he will stop boxing sometime in 2015. “I only got 24 months left,” he said.